For 8-12 travelers: choose a date! Poggio Verde and Elesta Travel are delighted to offer Northern Italy: Be Charmed!. With a home base at our comfortable villa, 8 people will receive door-to-door service and a private tour of the best that this fabulous part of the world has to offer. Please have a look at our Flickr account to see additional pictures of the things you will do and see during this fun trip. Arrival at Poggio Verde around 12:00. We will unpack, put suitcases in the deposit room, and receive a villa and grounds tour. At 1:00 we will head out for a tasty lunch at our favorite farm-to-table Giovanna Passeri Agriturismo. Weather permitting, we’ll take a walk in scenic Montevecchia. Then we’ll head back to the villa for cocktails and our first dinner together prepared by Mara Difino, our wonderful in-house chef whose selections over the next days will cover the best of Italian regional cooking. After breakfast, we will travel to Stresa around 9:00, a gorgeous little town along Lago Maggiore. We will enjoy a lakefront walk and shopping in the town. Lunch will take place at Villa Aminta restaurant, member of The Leading Hotels of the World, with its luxurious dining room from which you will admire an amazing view of the lake. After lunch, our boatman will take us to Isola Bella (Beautiful Isle), home of the breathtaking Palazzo Borromeo. We will have a personal guided tour of the palace and do some shopping on the island. Dinner back at Poggio. After breakfast, we will leave Poggio Verde at 9:00 and head to Bergamo. We will enjoy a guided tour of this beautiful hilltop town. Lunch will take place at Hostaria Uva Rara offering traditional but creative local cuisine. After that, we will travel to nearby Franciacorta, the home of Italy’s famed sparkling wine. Award-winning winemaker Camilla Alberti and her staff will introduce us to several of her finest offerings at the Castelveder Franciacorta. After a walk among the vineyards, we will return to Poggio Verde for a simple but delicious evening meal. After breakfast, you will enjoy your “home”, the fine estate of Poggio Verde. After a morning walk around the park of the villa. We will visit the romantic 11th century church St. Salvatore. For lunch we will head to a beautiful Michelin-starred restaurant, Pierino Penati, set in the verdant hills of Brianza. Its cuisine is very creative, prepared with top-quality ingredients and always focusing on the local culinary traditions. In the afternoon we will rest at the Villa and those who wish to will take a shopping expedition to nearby Oggiono. At 7:30 Mara will serve cocktails and dinner. After our usual tasty breakfast, around 9:30 our minibus will take us to Bellagio, The Pearl of the Lake. We will enjoy a tour of this charming little town and do some shopping. At lunch time we will head to Le Darsene di Loppia Restaurant, our favorite restaurant in Bellagio. The menu will be simple but sophisticated. After lunch, we will stroll through the gardens of Villa Melzi, with its interesting botanic, artistic and cultural patrimony. In the late afternoon, we will be driven back to Poggio Verde for our Italian aperitifs and dinner. After breakfast, our driver will take us to Milan around 8:30, where we will begin a guided tour that includes the Duomo and Leonardo Da Vinci’s Last Supper. Lunch will be served in the Michelin-starred vegetarian restaurant Joia. After lunch we will continue our visit with La Scala Theater. After the visit there are a few alternatives like free shopping or Castello Sforzesco or Piazza Gae Aulenti. Dinner back at the villa. This will be your last dinner with our wonderful chef Mara! After our last Italian breakfast together, and heartfelt goodbyes, our driver will take you to Malpensa Airport. Please note that plans may vary slightly due to weather conditions. Every change will be communicated in advance and substituted with an activity or meal of equal or superior value. 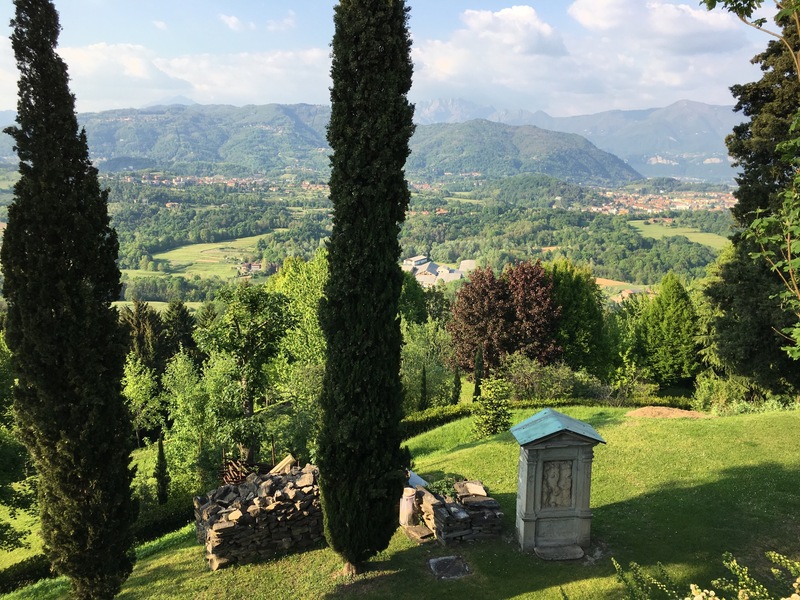 The price per person double occupancy includes all transportation (to/from the airport and to/from activities), at Poggio Verde Country Villa, our lovely Italian continental breakfast, lunch in or out as the occasion demands, meals at Poggio Verde, our local wine pairings, tips. A 500 dollars deposit is required to save your place on this trip. Please reserve your place by filling out the sign up form. To reserve a different week for your group of 8 people, please email Gretchen.